Our purpose was simple and important. This Assembly followed-up from the 2016 Assembly in Waskaganish, which helped to guide the writing of the CBHSSJB Strategic Regional Plan (SRP). The SRP establishes the priorities of the organization for 2016-2021. The 2018 Assembly identified and built important partnerships which will shape the future of health and social services for our people and our communities. 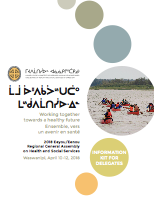 Because the CBHSSJB alone cannot create a healthy society, the Assembly suggested priority action areas for these partnerships between CBHSSJB, Cree entities and local and regional governments. We invited a group that is intentionally diverse, mixing policymakers with community members, elders with youth, and front-line workers with planners and analysts. There were 6 representatives from each community chosen by the community, CHB community organizers from each community, and 5 representatives from each CHB Department. We also invited representatives from the Cree Nation Government, including the Grand Chief and Deputy Grand Chief, as well as representatives from the other Cree entities. Health and Social Service representatives from the provincial and federal governments were invited as well. As in 2016, the 2018 Eeyou/Eenou Regional General Assembly on Health and Social Services used the Open Space methodology, which is democratic and highly engaging. Delegates were also invited to a World Cafe. There were two half-day of presentations on the SRP and examples of successful partnerships, and two days of interactive discussion groups where everyone’s voice counts.